The end of the year features a lot of special events at Walt Disney World. Between the Food and Wine Festival at Epcot, the Osbourne Lights at Hollywood Studios, Night of Joy at Magic Kingdom, and two different holiday parties, there is so much to choose from! 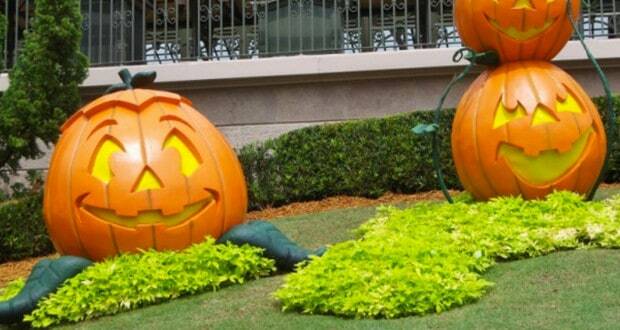 Now through Halloween, the Magic Kingdom is playing host to Mickey’s Not So Scary Halloween Party on select nights. There is so much to see and enjoy at this event, but here is our list of the top ten things you’ll love about the event! 10 – Specialty Merchandise – these special hard-ticket events offer up some great merchandise as a souvenir of the event or to round out a collection you’ve already started on. Available at various stores throughout the park, guests can choose from an event t-shirt, a special edition MagicBand, and an event pin. Annual Passholders can also pick up the limited edition exclusive passholder pin! 9 – Free Candy – what is Halloween without trick-or-treating? Various locations throughout the Magic Kingdom are set up to allow guests young and old to grab some of their favorite candy. The Cast Members who were manning these stations this year were VERY generous with the handfuls that they were handing out! 8 – Happy Hallowishes – the classic Wishes fireworks show is transformed during the party into Happy Hallowishes. Emceed by your favorite “Ghost Host” from the Haunted Mansion, this display features amazing fireworks accompanied by a great soundtrack! Be sure to grab a spot on Main Street for this fireworks display – you don’t want to miss some of the surprises in store! 7 – Celebrate the Magic – Disney puts some subtle changes into this show that precedes the fireworks display. Guests can enjoy scenes projected on Cinderella’s Castle from The Nightmare Before Christmas and other seasonally appropriate scenes, as well! 6 – Specialty Food Items – if all the candy that is being doled out isn’t enough for your sweet tooth, be sure to grab one of the special food items at various locations. At this year’s party, guests could choose from three different kinds of cupcakes, each adorned with a different Halloween theme – a ghost, spider, or a monster. If cupcakes don’t appeal to you, you could always sample the candy corn ice cream! 5 – Character Interactions – different characters are on hand to celebrate at the party, as well as to take pictures with guests. At a recent party, I was able to spot Tarzan and Jane in Adventureland, as well as Jafar and Aladdin. Guests can also meet with Snow White and all Seven Dwarfs near Seven Dwarfs Mine Train in Fantasyland. All told, there are over twenty different places to meet characters during the party! 4 – Character Dance Party – guests who would rather meet characters and dance the night away can do that at the Character Dance Party at the Tomorrowland Stage outside of Space Mountain. It is certainly worth a quick stop to see which of your favorite characters are busting a move and to grab a picture! 3 – Classic Attractions – some people would rather experience the ambiance of the park at night and awash in the oranges, purples, and greens of Halloween and enjoy their favorite attractions. Certain attractions are open during the party and guests can experience them with minimal waits. On the night of my party, I was able to walk onto Pirates of the Caribbean and get on Big Thunder Mountain Railroad with about a five minute wait! Be aware that guests cannot schedule FastPasses during the party, so you’ll have to wait in the (extremely short) standby line! 2 – Hocus Pocus Villain Spelltacular – featuring the bewitching Sanderson sisters from the 1993 classic, “Hocus Pocus,” this stage show takes place 4 times during the party on the stage fronting Cinderella’s Castle. It is a wonderful show featuring music from the movie, as well as visits from some of your favorite villains to help create the Hocus Pocus Party Potion! Be sure to get there early for a spot right near the front! 1 – Mickey’s “Boo-to-You” Halloween Parade – there is absolutely nothing disappointing about this parade. The parade is led by the Headless Horseman and features all of your Disney favorites, as well as some unique characters – Clarabelle Cow makes an appearance, as does Clara Cluck and some of the Country Bears and characters from “Song of the South.” Besides the soundtrack to the parade (which is amazing and has been on a constant loop since I got back from the party), guests will be mesmerized by the Haunted Mansion Cemetary Soiree. Not only are guests entertained by dancers re-creating the ballroom scene from the ride, but the most electrifying part of the parade are a bevy of gravediggers who dance with shovels and cause sparks to fly! Ticket prices vary depending on the night of the week you choose to attend the party and the closer you get to Halloween, but the event is certainly worth the price of admission regardless of what you are hoping to experience. Have you been to Mickey’s Not So Scary Halloween Party? What was your favorite part?